Cell proliferation assays, are now very commmonly used in a variety of research experiments. With techniques becoming more and more accurate, gone are the days where we use a simple counting of cells to understand the cellular proliferation. On a very broad sense, cellular proliferation assays are of various types including- Cell counting, Cell cycle measurement, BrdU/EdU uptake method, Dye dilution method. Of all these, in this post I will discuss about Dye dilution method since they provide great and easy measurements. In dye dilution method, cells uptake a fluorescent dye which is stably sitting inside the cell. In an ideal scenario, they are neither metabolised or removed from the cell. When the cell divides, the fluorescent dye is distributed equally between the two daughter cells. This can be captured as a fluorescent signal in flow cytometry. On a best day, this method can trace 5-7 generations of cell divisions. How do you apply this? Let us say, for example your experiment involves understanding what happens to a B cell after 4 rounds of replication, after you have stimulated them. For that you need to first know that the B cell has undergone 4 rounds of division. In Figure 1, the parent cell is in generation 0 (G0), which has taken up the dye fully (In practice, the exact concentraion of dye depends on the total dye used and concentration of cell in the mix). When the cell divides, the daughter cell (generation 1) has half the concentration of dyes. The 3rd generation of cell has 1/4th of the G0 and so on. This is reflected in Flow cytometry data, reduced intensity indicates subsequent generation. 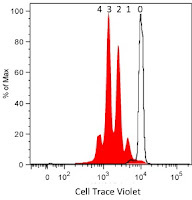 In an example (Fig 2) where cells have been stimulated and left for 48 hours before analysis, shows the histogram representation of data analysis. The plot shows that cells have made a maximum of 4 divisions (shown in red). The unfilled histogram shows the starting population of undivided cells. Note that the 1st generation has higher concentration of dye than the 2nd and hence is more brighter (hence the peak towards right). The height of the peak represents number of cells. There are several such dyes available in the market. Some of the most common dyes that you might have heard about include CellVue Claret, Cell Trace Violet, eFlour etc. The choice of dye is based on several parameters such as if It is taken up by live cells, Intensity of staining, cellular retention, segregation between daughter cells. Intracellular proliferation dyes as the name suggest binds to intracellular contents. One of the most commonly used dye under this banner is the CFDA-SE (Carboxyfluorescein diacetate succinimidyl ester). CFDA-SE enters the cell where it is acted upon by cellular esterases which cleave the compound into CFSE (Fluoerescent compound) which stays intracellularly by binding to intracellular lysine residues and other amine sources. However, the CFSE has a toxic activity and hence these days, Cell Trace Violet is more commonly used. Cell membrane dyes are the ones, which bind to cell membrane contents and give a fluoerescent reading. CellVue Claret, a red dye is one of the best example in this category. Table 1 gives the most Common Cell Proliferation Dyes that are in current use. Most recently, a method called as HCS (High content screening) is begining to turn out to be more sensitive when compared with dye method. The reason being they are more sensitive and superb signal-to-noise ratios than other methods, owing to their automated measurement of synthesis of new DNA. In reality this system is an improved version of BrdU/EdU uptake method using an automated platform.